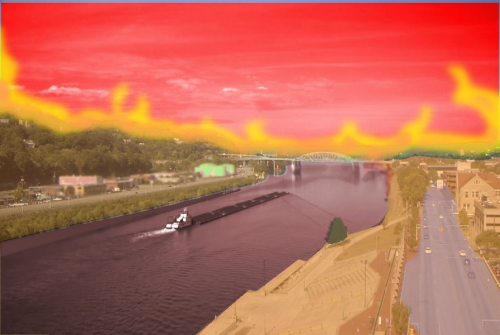 Remember the time that the Devil, himself, blew up South Charleston? It was in all the papers. Anyway, here’s a photo of what that event looked like as seen from Downtown Charleston. Accompanying this picture is a special piece of Halloweeen music–all nice and apocalypty. In fact, both the music and photo are titled, Apocalypse On The River. The first half of the music is an old piece of music I wrote called “Machines Failing,” but in honor of the holiday, I wrote a new, orchestral, finish to it. Despite my compositional ineptitude, you may still notice that the end part is a wee bit similar to parts of Carmina Burana. I went for typical scary movie music, and that was what got stuck in my head. So I admit that it’s not the most original thing I’ve written, but after all, imitation is the flattest form of sincerity.